It must have been a quick summer, because it seems just like yesterday we were quizzing our children on the punjabi alphabet and the meaning of several saakhis as they were preparing for last year’s final exam. The khalsa schools have come a long way since my time, with many of the teachers collecting attendance on iPads and posting homework online for parents to check assignments. Lesson plans have also progressed thanks to the hard work of SikhRI and their Sojhi curriculum. And I know the children are learning, as we see their progress first hand at home. Looking at the progress in it’s entirety, I feel proud to say, “the kids are going to be alright.” But it raises another question…what about us? I come from the school of thought that a Sikh is a student and a gurdwara is therefore a place of learning. And although here in the US, we’ve made significant progress creating learning opportunities for our children, and committees proudly beat their chest over how much they are “all for the kids“, why is it that adults are ignored? We surely don’t know it all. I’m the first to admit having to do a little “research” in order to help my daughter with her khalsa school homework. But more importantly, why don’t we value the importance of continuing gurmat education while in adulthood? Sure, there are plenty who take enough from their individual learning or listening to katha, but there is a certain value to consistent and structured learning through interactive sessions by an instructor. Without this, our children will learn and grow toward Sikhi while we remain stagnant. Why is this important? Any educator will tell you that lessons are most effective when parents reinforce concepts at home. And if the parent don’t have strong gurmat fundamentals, how is there supposed to be any such dialogue? Instructors at schools and camps work had to to inspire children to further their commitment to the Guru, and if that is not encouraged at home, all is lost. I’ve seen it too many times where kids in our community leave camp inspired to make a change, be it wear a dastaar or ready to take amrit only to be discouraged by their parents when they get home. It’s as though everything that was done at the camp is simply undone. Years ago as a camp director, parents would push me to hold simultaneous parent workshops along the same theme as the children, so the parents can learn as well. And although we tried, limited resources made it tough, and now I find myself as a parent asking for the same thing. Incorporating gurmat education for adults in our gurdwara is no easy task. There are certain things you need (1) a group of adults (willing to admit they don’t know it all) that are committed to attending weekly classes and completing assignments (2) a committee willing to invest resources in adult education (3) a knowledgeable and charismatic instructor who knows how to manage a class of adults with varying degrees of knowledge (4) and let’s face it…a keertan jatha who is willing to sing to a sparsely filled hall at times while parents and adults are in class. As impossible as this seems, I had the opportunity to visit a gurdwara in Southern California that has most of this figured out. Some of the young adults even attend the class along with their parents…and both are raving about the results! Some may be thinking I’m making a “mountain out of a molehill” here. And I’ll admit the ramifications of this issue are harder to see. But in my opinion, gurmat education for adults will be the most critical thing to help Sikhi flourish here in the US. It is imperative we create an environment of gurmat learning in both our households and gurdwaras. And until our gurdwaras catch up, we as parents must take the initiative to create learning groups amongst friends and sangat for our gurmukhi learning and perhaps parent/child co-learning groups for gurbani. Think about it…as Sikh families we get together all the time, wouldn’t it be nice for one of those gatherings to be themed around a shabad, with translation activities, discussion, and crafts all around that shabad? Can you imagine the drive home discussing the shabad with your kids? 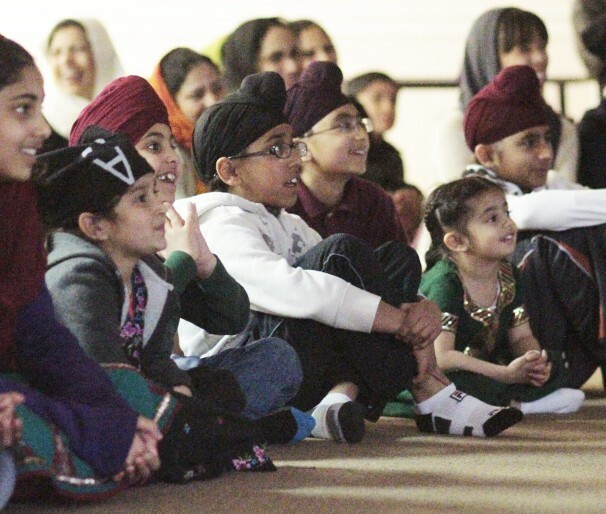 Sure this co-learning may expose what we don’t know…but we need to get over it – not only for our own personal development, but it also sends a clear message to our children that in the life of a Sikh, the learning never ends.